Additional announcements are now emerging about European films that premiered at the recently concluded Cannes Film Festival that have found distribution in the United States. 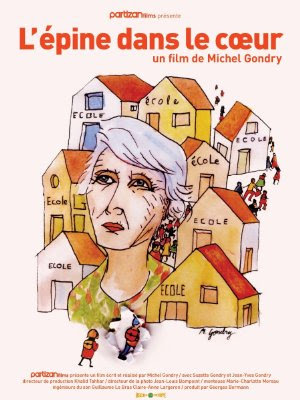 The latest news hitting the film trades has startup American distributor Oscilloscope Pictures scooping up North American rights to Michel Gondry's new project, a documentary called THE THORN IN THE HEART (L'Epine dans le coeur) that was screened in Cannes as a special screening. The film is a passion project for the director, centering on schoolteacher Suzette Gondry, the director's aunt and matriarch of his family, and her relationship with her son. The film is both a personal tale of one family's secrets and a larger story of life in rural France. Partizan Films produced and financed the pic, with Studio Canal in place as international sales agent. Oscilloscope, which will release theatrically as well as on DVD and via digital platforms, has been active in picking up European and international titles for the North American market. They recently picked up North American distribution rights to Irish director Lance Daly's award-winning feature, KISSES, a romantic coming-of-age film about with remarkable performances from its two young leads (newcomers Kelly O'Neill and Shane Curry); and the documentary BURMA VJ, by Danish director Anders Ostergaard. Oscilloscope Laboratories is a film production and theatrical distribution entity launched in 2008 by Adam Yauch of the Beastie Boys.